Yes there are Elk in Texas! And free ranging herds at that. No draw needed and no season. hunted year round although better times are during the months of May through July. Please inquire for references to these hunts, most are listed at the bottom of the Booking/Contact Us page. Additional Hunt days are $550.00 per day and include lodging and meals. Up to 3 nights lodging is included on a 3 day hunt. We hunt several different properties in the Van Horn area for Elk and on occasion in the Fort Stockton area. These Elk have migrated down from New Mexico and a few were also transplanted over 50 years ago into this area to try to reintroduce a strong herd to the west Texas region. These are true Free Ranging Elk! Hunts will take place over large irrigated fields, water tanks, and surrounding brush country where the elk feed and bed regularly. Bulls range in all sizes and it is the hunters choice on what he or she would like to harvest with no size or point limits. Herds range in size from 5 to 25 plus animals. We will also offer a few cow elk hunts each year to regulate the herd population. This is a great hunt for someone not wanting to travel long distances out of state and still get a true free range Elk hunting experience or for someone tired of not getting drawn for an out of state tag. Prices are very competitive to others in the area and with a flat fee (no trophy fees) this hunt can not be beat! Very few hunts will be offered each year and we will pre book up to 2 years in advance. Hunts will be offered starting in August for a hunter wanting a nice bull in velvet and in September or October when they are hard horned and in the Rut. Hunts also offered during the winter months if available. These Elk will make excellent table fare with there diet being mainly alfalfa and other various crops. Bow or rifle hunters welcome. Hunts will be conducted Safari Style and out of Blinds. Our hunts are perfect for anyone in any physical condition due to the flat terrain, good roads, and easy access to the fields. Shots in the 300 to 400 yard range will be expected and a minimum caliber of .270 or similar is required with a .30 caliber rifle highly recommended. Archery or Pistol hunters can be set up over water holes for closer shots or at the edges of the fields where the Elk funnel into feed. Make sure you bring at least 2 Large Ice Chests for the meat, ice can be bought in town only 10 minutes away so no need to travel with it prior to the hunt. Taxidermy is available at several nearby locations. No Draw or Tag is needed, Elk are considered an Exotic in Texas so a General Resident license is all that is needed to hunt one or a 5 Day Non Resident license which is only $48 over the counter. We expect 100% shot opportunity on these hunts. Elk Hunt Photos Click Here! Both Ranches are available on a limited basis. Please contact for current openings and availability. Note to Hunters: Our hunts taking place in the Sonora Texas area offer a nearby Taxidermist and Meat Processor at your expense. Most animals taken outside of deer season can be processed into simple cuts in just a few days time for your convenience. Axis hunts can be combined with additional Exotics on nearby WTHO properties. Free Range Trophy Hunts will take place primarily on the Diamond TF Ranch just outside Sonora Texas. The ranch is 2,000+ acres with plenty of water, food plots, brush management, and protein. Free range hunts will also be offered on the Los Cuernos Ranch (also in Sonora) on a limited bases. Hunts will be kept to a minimum to keep quality and success rates high. The hunt will take place over a food plot, feeder, water hole, or stalking in the surrounding hills. We will be after a Buck in the 30 inch plus range on trophy hunts and average bucks taken are 31" to 33" plus. We have offered a 100% Shot Opportunity on our free range hunts for the past 4 years. Any Hogs or Predators seen during your hunt may be taken at no additional charge within reason. Does may be available if population allows for it. The Diamond TF And Los Cuernos Ranch both offer an excellent Turkey population and a Turkey can be added to your bag limit on a trophy fee basis during the Spring or Fall season if available. There are also some nice Trophy Black Buck on the ranch that can be added to your hunt for a trophy fee. Fenced Trophy hunts will take place on 800 acres inside the Los Cuernos Ranch. 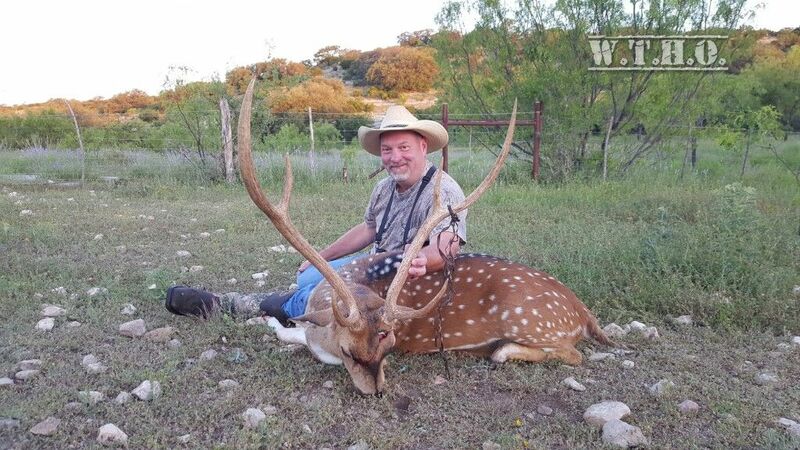 There is a very high population of Axis in the preserve on the ranch with multiple mature Trophy Bucks hard horned both during Summer and Winter. Nice on site House to stay in that can sleep 8 comfortably. While on a Trophy hunt a doe may be added for $350. This ranch has offered 100% multiple shot opportunities to clients the past 3 years. Outside of the preserve there is an additional 3,200 free ranging acres available to hunt. The Axis population here is fair to good with a high trophy quality, only a few hunts will be offered on the low fence portion. The majority of our Axis hunts will be conducted during late Spring and Summer when most of our Axis are hard horned and when they are rutting. A handful of fall and winter hunts will also be offered. Management Buck hunts on both the Diamond TF or Los Cuernos ranch are available on a limited basis throughout the year. They will be broken horn bucks posing a threat to larger mature Trophy bucks, older bucks past there prime, or bucks with inferior genetics. Please contact for pricing and availability. Whitetail hunts may also be available on both above listed properties. Axis Hunt Photos Click Here!